What is the origin of BSO - and is it internationally recognized? Who is the first person who came up with the appellation, "Bicycle Shaped Object" (BSO) referring to very inexpensive and very poorly built bicycles sold through mass-market department stores? Bonus question: And is it international? We use BSO in America and I've heard b.se members from Australia and New Zealand use it, but is it used in the UK and Canada? What do people in France or Japan or other countries call BSOs? If the bonus question makes this question too broad then I'll withdraw the bonus and make it a separate question. In German, I have never heard anything similar. I think one reason is that everyday cycling is more common and many people have a cheap, battered bike to get to the railway station or the local shop, so you could argue that most bicycles you see in town would be seen as BSOs by UK cyclists. It doesn't make sense to invent a new term for something that is common and already has a name. When you observe bikes in town, in the UK (where I live now) you can rather clearly see two distinct groups: high-end bikes for the sports market (and people dressed accordingly) versus really cheap ones (often students in uni towns). In Germany it's much more a continuous spectrum with a lot of middle ground of various urban bikes, so it would be difficult to draw a boundary. Most people buy bikes in the local bike shops, but shops tend to have a wide variety from cheap, simple, factory-built ones to high-end custom-built, so the fact that they are sold in LBSs isn't necessarily a criterium for quality or price. Another factor is that "BSO" is a term that is a bit arrogant and derogatory, sends the message: "You are not doing it properly", which is what bike advocacy groups really want to avoid. In Germany, cycling is very much seen and promoted as everyday activity, and the cycling groups want to avoid terminology that would people off. It's better if people cycle on a cheap bike than not cycle at all. It's possible that the cycling sports community in Germany has derogatory terms for non-sportists, but I don't think it's common outside. Again, in UK the community is different and more sports-oriented (although that's beginning to change, in the last 5 years or so). 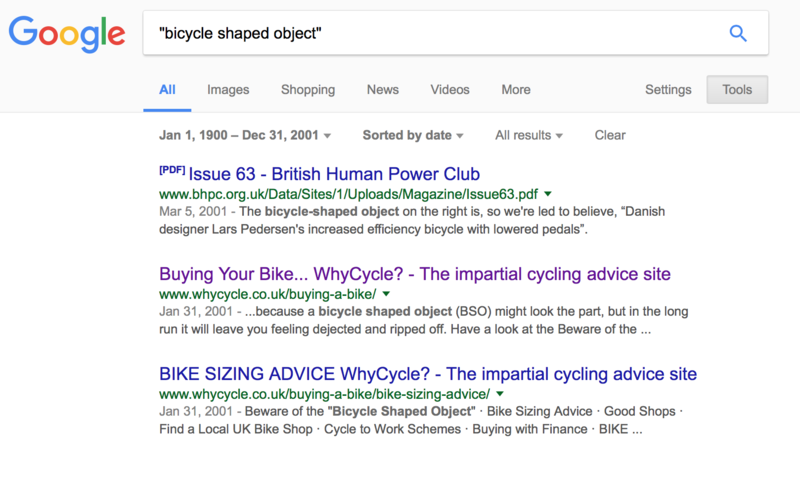 They link to WhyCycle which refers to a page by TheCyclingExperts titled "The Bicycle Shaped Object." Since both sites are UK sites, the first use on the internet seems to be from the UK in 2001. It's not clear if the Cycling Experts came up with the term themselves or if it was in use before 2001.... I'm actually surprised that Sheldon wasn't the originator. In Russia, the term for BSO is "ашанбайк" (ashan-bike). It's named after one big supermarket which primarily sells food, but also BSOs. There are a lot of places in Russia where it's possible to find BSOs, but specialized bicycle stores usually don't sell them. BSOs are rarely seen on streets (at least in St.Petersburg), probably because riding BSOs is harder than bicycles and people just give up and use public transport instead, because in Russia public transport is cheap. This may change in near future though. In Poland "BSO" term is not widely recognized, nor used. This site is the very first place I've encountered it. I guess in non-english speaking world the situation is similar. If one will translate this term to polish, taking into account cultural context, it would be "wyrób roweropodobny", what, when translated back, whould mean: "bike-like product", "bike substitute product", "fake bicycle", as we had "fake chocolate", "fake cheese" and so to describe cheap substitute of some goods. This term is not widely used. What is widely used as equivalent of "BSO" in Poland is "rower marketowy", what, generally speaking, means: "bicycle from supermarket". The polish translation of "bicycle" whould be "bicykl", BUT this word is rather old fasioned and obsolete. We use word "rower", which comes from polonified name of british company "Rover" owned by John Starley, that were exporting its early production here in 1885. The only people who know about it are the ones like me, who spend time reading about bicycling when not riding out there! A Bike is a motorbike! MTB style frames? Cheap dual suspensions? Y-Frames? Glittering multi-coloured stickers? We have them all but they still are not BSOs! I'm from the UK and we definitely use the expression BSO and I've certainly known the term since the very early 90's. As other posters have said, it normally denotes a very cheap bike from a department store or chain store and can be recognised by nearly always being made from poorly MIG welded steel tubing rather than the TIG welded alloy, cromoly or even titanium of more expensive 'proper' bicycles. Not the answer you're looking for? Browse other questions tagged terminology bso or ask your own question. Is there a bicycle designed for slow riding? What is the difference between a “single-speed bike” and a “fixed-gear” bike? What does the term pannier really mean? Does how the bag is hung matter? What's the difference between a Gran Fondo and an Étape? What is the purpose of the rubber stripe between the wheel and the air chamber? What does “claiming the lane” mean? What does 'tire clearance' mean? What is low gear and what is high?